Susannah Kelton returns to her childhood home, an old mill in New England she has just inherited, with her husband Mike. The islanders are openly hostile to the couple and aghast when they hear that they are going to convert the mill into a summerhouse. Ethan, Susannah's brutish cousin, tells Susannah that the mill was promised to him. 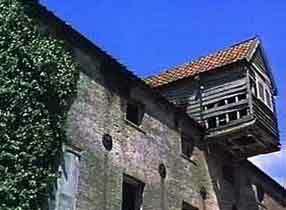 Susannah is curious about the shuttered room on the top of the millhouse and decides to investigate. Frightened by the building, she is about to leave when confronted by the lecherous Ethan. She takes refuge in the shuttered room but is pursued by Ethan. A figure attacks him from the shadows, and Ethan falls to his death. What is the secret of the shuttered room? 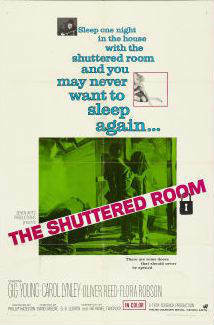 Britishhorrorfilms: The Shuttered Room is very enjoyable, right up until the derivative end. 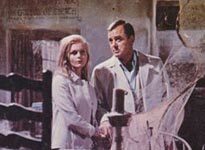 It has a gorgeous heroine, a cool-as-ice hero, a terrifying baddie in Oliver Reed, and enough plot twists and turns to keep you guessing up to (almost) the end. Based on a short story by August Derleth.